Every once in awhile, a new credit card is unveiled that offers everything any consumer could want. The fact that this latest offering is coming from the company that’s ranked number 1 for the past sixteen years in customer satisfaction only makes it that much more exciting. 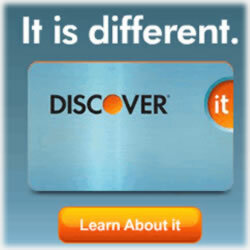 Discover is heavily marketing its It card and consumers are flocking to it. It unveiled just days ago and it’s already catching the attention of its competition – and for good reason. It is bringing consumers perks and benefits we only dreamed were possible. But here’s what no one expected: Discover has eliminated all of its consumer credit cards and replaced them with the much more versatile and easier to manage Discover It card. That said, its business credit card offers haven’t been streamlined – though it could happen in the near future. It’s a bold choice – but it looks as though Discover has the winning formula. Here’s a bit more about this revolutionary new credit card offer from one of the highest ranked banks in the world. To be sure, it most certainly lives up to its name. Remember when owning credit cards was less about the social status and more about building financial relationships with our banking and credit entities? And remember when the legal jargon wasn’t so overwhelming, but instead, was simple and to the point? Discover is hoping to recapture those earlier times when trust mattered and simplicity was everything. No hidden fees, no tricky fast talk – just plain and simple credit that didn’t break the bank to actually own. It’s been a long time in the making and the public response cements everything the credit card giant was hoping for. Already it’s being ranked higher than any other credit card in the industry. There is no annual fee – ever and if you miss a payment, the first time you do, your late payment is waived and even better, it won’t come back to haunt you on your credit history. You won’t see an increase in your APR either because of that late payment. There are no over the limit fees nor are there any foreign transaction fees. Remember a few months ago when you had just about dozed off and suddenly, out of nowhere, you remembered you forgot to make your credit card payment last week? There is nothing worse than realizing you forgot to make a payment two hours after the due date. With the Discover It card, you have until midnight on your due date to pay online. No frustrating 6 p.m. cut off dates, no last minute fees if you make the payment via phone and no worries about making the payment at 9 p.m. on the due date and still getting hit with a late fee. Oh – and did we mention you decide your due date? With millions of us using Amazon more than ever, you can use your Amazon rewards earned to cover nearly any purchase on the Amazon website. Amazon isn’t exactly part of a co-branding effort, but like so many other credit cards on the market today, there are those retailers that are highlighted in the card company’s efforts of drawing in new consumers. We can’t think of a better company the card company could partner with. It works and it works well according to those we’ve spoke to and who already are using their Discover cards (which, by the way, is rushed to you upon approval – making it a breeze to start shopping right away). Card members earn earn 5% cash back in categories that rotate four times a year. All of your other purchases earn at least 1% cash back. If those were the only perks, it would be an easy effort to convince consumers to give it a try. But there’s so much built into this offer. If you lose your job, all you have to do is contact the card company and they’ll work with you to come up with a much lower rate and lower monthly payments. The key here is that the customer service team will explore all of the options with the goal of finding a solution that works for you versus tossing out a few so-so offers, you actually get some say in how it all looks with those changes. Keep in mind, though, these special terms are good for a small window of time, so it’s important to remain realistic in your conversations. And speaking of limited time frames, you’ll be happy to know an intro 0% APR rate on both your purchases and balance transfers for a full fourteen months comes with this Discover credit card. After that, you’ll see your APR hover between 10.99% and 19.99%. Also, a flat 3% fee will apply for any balance transfers your put into motion. Of course, Discover is known for its rotating 5% cash back opportunities and they’re still applicable with the It card. Each quarter the categories shift and what’s great about this is the categories are typically applicable to the traditional expenses we make at those times. For instance, in the fourth quarter, you’ll find bonus categories for retailers while your summer months allow you to enjoy 5% cash back in places we traditionally shop for back to school. A word of caution, though. You should know that each quarterly incentive has a cap on any category purchase and it’s imperative that you sign up each and every quarter. It’s not a “sign up once and you’re done” scenario, but every three months – every single year – you must renew that quarter’s offerings. If you go over the cap, you’ll still enjoy the 1% cash back on your purchases, so you’re always earning. Be sure to check the Discover website and specifically its online calendar so that you’re always in the know when it comes to cash back categories. The Discover It for Students is another great aspect of this financial product. With the same benefits and advantages we’ve come to expect from Discover, this credit card offer is ideal for parents who are wanting to instill strong financial habits into their young adults. Even with the new credit card laws, the Discover It for Students has emerged as a great product that doesn’t hone in on those weaknesses young people usually have. Those weaknesses, of course, being inexperience with the credit system. There’s a good chance if the student is under the age of 21, he will require a co-signer unless he can prove the ability to repay the debt without any kind of security mechanisms (a cosigner). The same perks and benefits apply, including the bonus 5% cash back categories. All other purchases your student makes is eligible for 1% cash back. The new card will be expedited for your student and because it has the same first late payment forgiveness dynamic, there exists a bit of room for error. Be sure to review the terms and conditions, though, so that you’re aware of what the compliance issues are for this credit card offer. This was a bold move by Discover and one, that if successful, will forever change the way we shop for credit cards. And too, it’s entirely likely we’ll see the other big names in the credit card sector follow suit.